Award-Winning Kerrville, Texas Hotel's Priority is YouHere in Kerrville, Texas, guests experience the charm of Texas while being close to the wonders of nature. 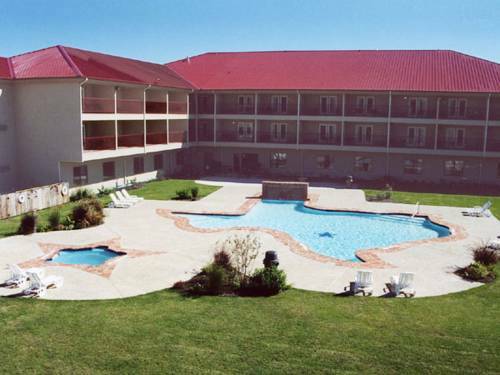 Because we're situated just off Rt-16 and I-10, our hotel's guests can easily get to nearby Fredericksburg or San Antonio. The Holiday Inn Express Hotel & Suites Kerrville, fully renovated in 2013, offers outstanding service and value.If business brings you to Kerrville, you can heck your email by the fire in the lobby or in the Business Center using the free high-speed, Wi-Fi access, and our 1,864-sq-ft meeting room is large enough to accommodate 175 guests for your next business event. It's also easy to get to James Avery Craftsman, Schreiner University and the Y.O. Ranch from our hotel's address in Kerrville, Texas.If you're visiting the Hill Country on vacation, we've got you covered. The Y.O. Ranch and nearby Bandera lets visitors see what being a cowboy is really like,. You can take a day trip to visit the Alamo or enjoy the excitement of Six Flags San Antonio down I-10.Our hotel's guests love our many great amenities. Take a swim in the giant, Texas-shaped pool or relax in the Lone Star whirlpool. If you enjoy working out, the Fitness Center is ideal for you. Every morning, we serve a free, hot Express Start Breakfast Bar. See for yourself why our award-winning service and quality are second to none.